Is your loved one in the military, law enforcement, FBI or other tactical position? A tactical watch makes the perfect gift! They have so many useful functions. We’ve put together this tactical watch buying guide to make it easier for you to choose one! No matter what field they’re in, your loved one will love any one of these tactical watches! Let’s look at some of the things you should know before you go shopping for that special gift! Band Material: The band material makes a difference when you look at how durable the watch is, and how comfortable it is to wear. Nylon is comfortable but it’s easier to cut through, whereas rubber sometimes pulls your arm hair. Water Resistant Depth: This is the depth at which the watch will still work. Deeper water resistant depths are great for swimming or scuba diving. Some watches are only water resistant enough to promote showering while you wear them. Case Diameter: This is the size of the watch face. A bigger watch face will be easier to see during every one of the functions it boasts, while smaller ones won’t get in the way as much. It’s personal preference. Multi-Functional: Does the watch just tell time, or does it have other features as well? Some watches have altimeters, barometers, world clocks, or even GPS systems or weather trend features. Others simply tell the time with no extra frills. LED Backlight: This makes the watch easier to read in the dark. Most often it’s activated by a button on the face of the watch, so it doesn’t stay on all the time and drain your battery. Warranty: You want your watch to work right, and most companies do as well – that’s why they offer a guarantee that if your watch has a defect on arrival, you can get it refunded or replaced with no extra hassle. Now that you know what to look for, we can show you our best tactical watch reviews! If you’re in a hurry, look at our top and budget picks first, as they will show you the best of the best available right now! The rest of our list is full of great tactical watches so make sure that you read to the end. You might just find your new watch, or the perfect gift! 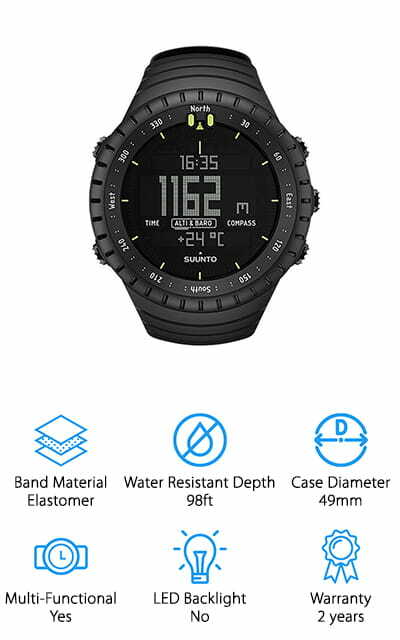 The Suunto Core watch is your perfect all-function tactical watch! There’s a built-in altimeter that tracks your movement, a barometer that shows you the air pressure, and even a compass to show you which way you need to be going. There’s a weather trend tracker and preset times for both sunrises and sunsets. This watch has a rotating bezel for the compass feature, so you can lock into your destination and follow it through! It’s got a time, date, and alarm function. It’s our pick for the best digital tactical watch because of all the features it has, as well as the huge 49mm case that allows you to see everything with crystal-clear accuracy! We love all the features this watch has, and the fact that it even tracks the weather trends! You’re sure to get tons of use out of this digital tactical watch. It even has a storm alarm feature that notifies you of approaching storms! The Fanmis Military Watch is the perfect tactical accessory for your budget! 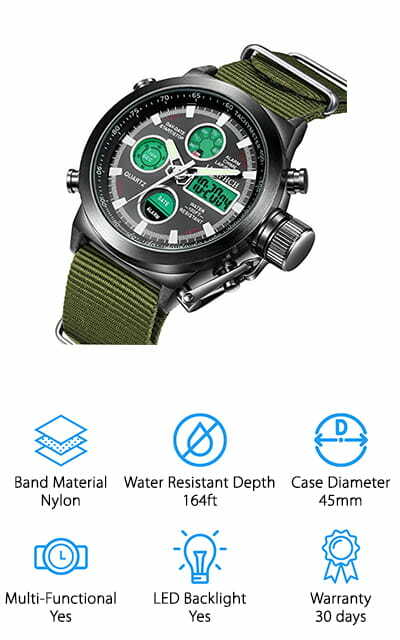 Our pick for the best cheap tactical watch is waterproof to an amazing 164 feet – perfect for swimming! It’s got a dual dial so you can track the times in two different time zones, as well as being shock resistant. It also has a stopwatch and an LED backlight so you can see better in the dark. The watch band is made of silicon rubber, which is comfortable and flexible so it won’t pull at your hair. The stopwatch function is pretty amazing, and we love that the watch displays both analog and digital times! If you need a watch that’s going to display in 24-hour time, this is the one you want! 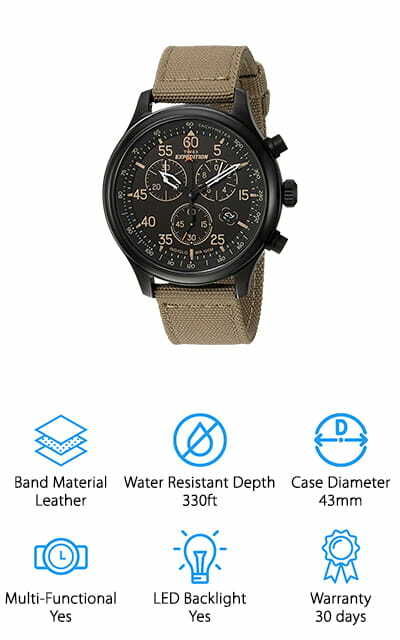 It can display both military and 12-hour time so it’s customizable to your needs and lifestyle! We love that you don’t have to stress about taking it off when you go swimming. Timex is a classic watch manufacturer, and the Expedition Field Watch is the perfect addition to their collection! It looks like a vintage military watch, a feature that we love and we are sure that you will as well. Three sub-dials are embedded behind the larger face that track smaller time increments for up to 30 minutes. At 4 o’clock there is a date window, and you can change the date fairly quickly with this watches’ Quick Date function. It has a leather strap that looks great and feels comfortable and is water resistant down to an amazing depth of 330 feet. The illumination system is what makes this one of the best tactical watches. The Indiglo system lights the surface of the watch in blue light that is specifically designed to make your battery last longer! It uses new, patented technology to provide you with a light long after other watches have stopped. We think that’s great. The PALADA Military Watch is a great tactical watch for someone on a budget! It’s water resistant to 164 feet, which means that you can go swimming and wear the watch while in the shower. That’s awesome! There are quite a few features in this watch, but the one that stands out to us is the huge digital display. It’s so easy to read and convenient! It also comes with an LED backlight for low-light situations, a stopwatch that counts down to 1/100th of a second. It’s shock resistant as well, and can display time in both 12- and 24-hour formats to fit your preference. It’s got an auto calendar that you don’t have to set, as well as an alarm clock and an hourly alarm as well. You’ll never not know what time it is! Plus, we love that the face is acrylic and resistant to compression and abrasions. Get the most out of this cheap tactical watch! The LYMFHCH Big Face watch has a case diameter of 45mm, so it’s large enough to see while still being small enough to stay out of your way while you’re working! It’s got enough weight to it that it feels comfortable on your wrist, which is a definite bonus! It’s moisture-proof and waterproof up to a depth of about 164ft, so don’t sweat the swimming pool! The band is easy to adjust and fits comfortably. The knob that you use to set the time is actually under a screw cap, which is a nice little feature that keeps you from accidentally setting it! The second hand on the analog clock has a red tip, making it easier to see on the dark background. That’s pretty amazing! Compared with the LED light, you’ll always be able to see it. It can withstand high temperatures as well! Do you want to know the best part? It’s accurate to satellite time! The case on this INFANTRY Tactical Watch is amazingly large! At 50mm, you’ll even be able to see this time from a distance! The dial window is made of mineral glass, so it’s hard to scratch and resistant to abrasions. The band is a soft, heavy-duty rubber that’s comfortable on your wrist! There’s an alarm, a stop watch, and even the classic rotating bezel that makes these watches so desirable! It even has a backlight so you can read it perfectly every time. You can have it display 24-hour military time if that’s your style. 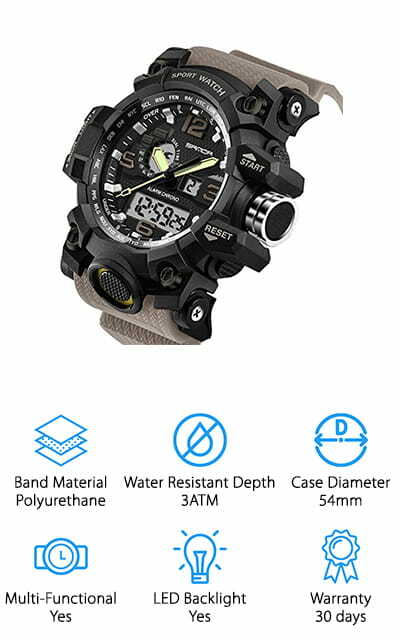 This is definitely a contender for the best tactical watch for sale! We love all the features, including the stopwatch and calendar. Even the 1 year warranty is pretty amazing! The movement is Japanese quartz so it is going to be smooth and accurate. 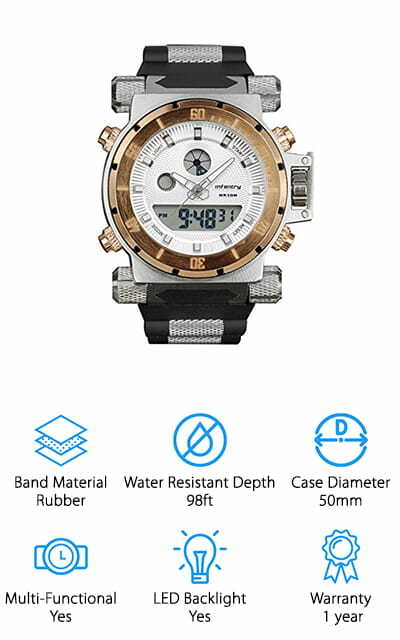 The back of the watch is stainless steel, and the case itself is a heavy-duty aluminum alloy! The Sanda Military Watch is on our list as the best tactical watch for police. The polyurethane band is super durable and won’t break easily. The case is a whopping 54mm, so you’re definitely going to love it if you love those large watch faces! It’s an Army design, so it looks very sleek and professional. The large dial is white for that added touch of sophistication. It’s a watch that you can wear every day, with every different outfit and it isn’t going to clash. The Polyurethane makes it flexible as well, so it’s going to bend with you when you need it to, instead of breaking. 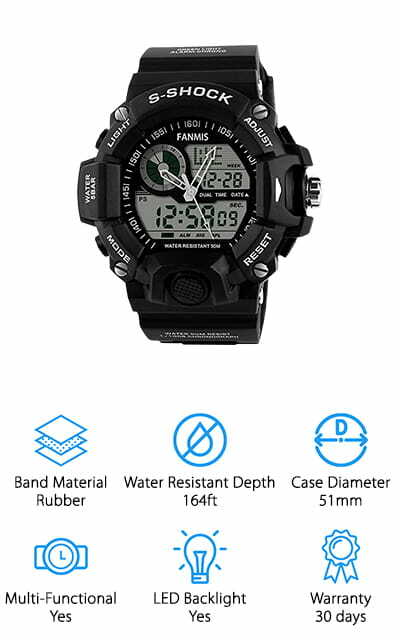 It’s shock and water-resistant to rain and splashes and comes with both a 12 and 24 hour time format. The LED backlight is nice and clear, allowing you to tell time no matter how dark it is. It’s also got a super accurate stopwatch on board for more intense activities. The BINZI Military Tactical Watch is packed full of features that definitely make it a contender for the best tactical watch! It’s a round watch with a 50mm face – it’s huge and extremely visible! It’s a corrugated bezel that rotates each way, as well as an hourly chime feature, an alarm clock, and the ability to switch to a 24-hour format. We really appreciate that feature! The calendar is pre-programmed and displays the day and month. The backlight illuminates the digital part of the watch. There’s a large silver dial with illuminated hands, so you can always see what time it is! It’s super accurate and comfortable with a silicone/rubber strap and stainless steel case. Customer service is pretty amazing through this company, as they boast that they have a 24 hour customer service email line. We love the split time function and two types of time display. It is stylish and extremely useful! 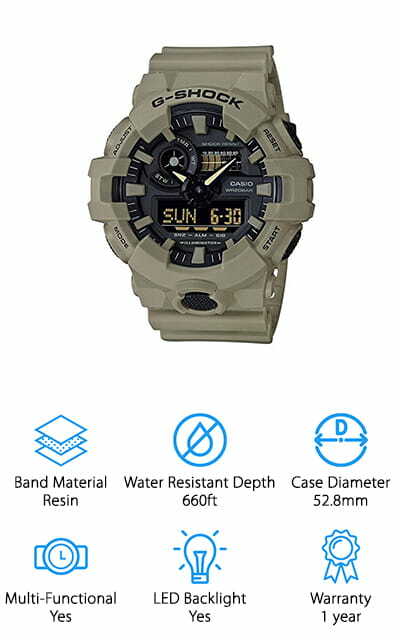 Casio is one of the best tactical watch brands on the market, and the popular G-shock model meets these expectations and more! Where this watch shines is its water resistant depth, which is an absolutely stunning 660ft below the surface of the water. 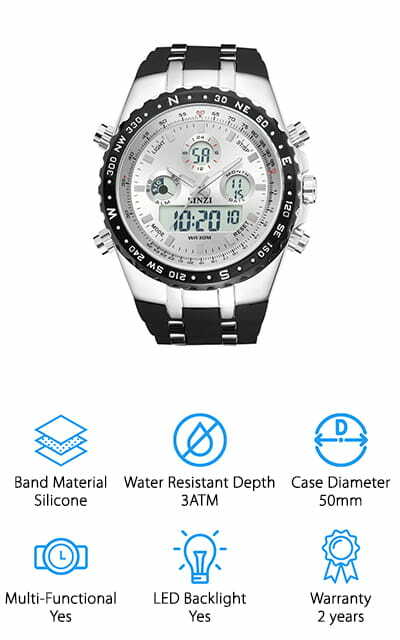 Snorkel or dive with this watch on and it will still work fine! You can set the LED light duration to stay on for 1.5 seconds or 3 full seconds. There is a built-in stopwatch that houses a range of features including elapsed time, split time, as well as 1st and 2nd place times. There’s a nifty feature that shifts the hands of the analog display out of the way so you have a full view of the digital display features. The case is a full 53mm wide, so you’re going to be able to see it perfectly on your wrist. There are five daily alarms you can set, along with one snooze alarm! Garmin makes luxurious, feature-rich sports watches – this one included. It’s a great company known for its quality. The Tactix Bravo’s main distinction on our list is the GPS feature! It’s highly sensitive and works well as a navigating device as well. The altimeter, barometer, and 3-axis compass all work together with the GPS to bring you the most accurate information! It’s got a 1.2 inch display that is readable in sunlight due to the special composition, as well as a backlight with a night vision mode so that it doesn’t interfere or damage your ability to see. 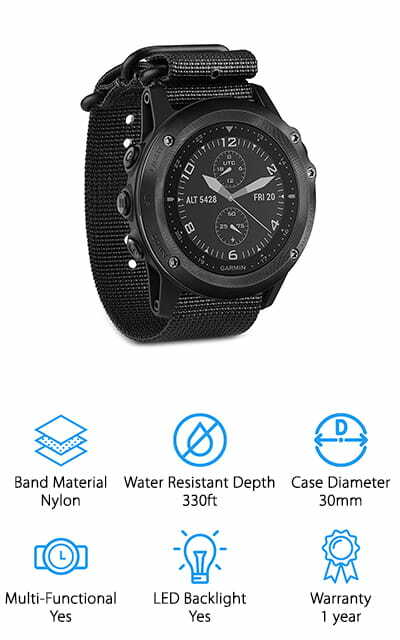 It’s an all-black watch that doesn’t reflect any light, making it the best tactical GPS watch for use in the field. This watch is the real deal! It even has a Wi-Fi receiver built-in for software upgrades! It’s the most advanced watch on our list. The entire watch is made with high quality materials that look absolutely stunning!